There’s something about a white bowl filled with tomatoes of varying ripeness and color that makes me very happy. The kind of happy where I hug myself a little bit. Really, I do. Add to that beautiful, fragrant basil and I have a perfect bouquet. 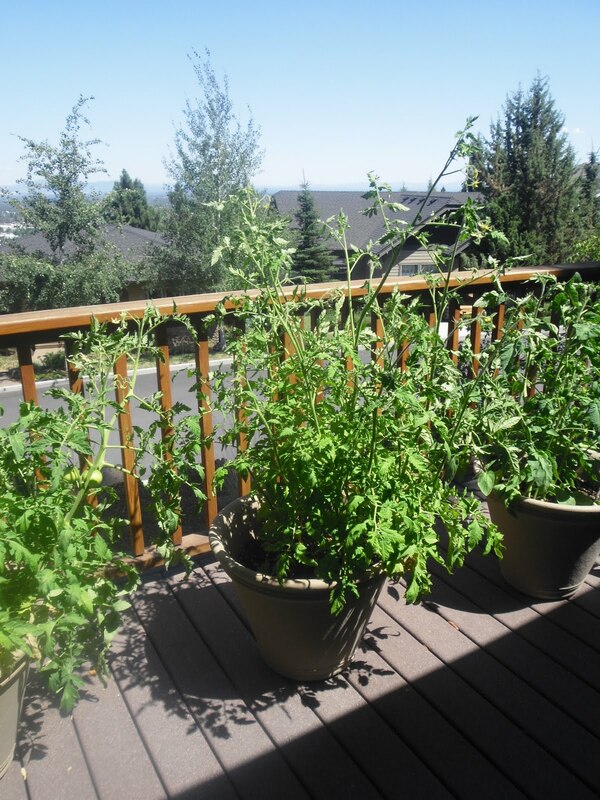 We were lucky as both our tomato and basil plants grew very well, in pots out on the deck, this summer. The tomatoes were a true labor of love. We started them from seeds and put them in the girls’ dollhouse because it’s right in front of the sunniest glass door in the house. Bob, Ella, and Hailey made sure they had plenty of water and conversation. It was so fun for the girls to watch them grow up to be huge plants outside. For the last month they’ve been bringing me the tomatoes they pick from the vines… It’s soul-satisfying! Caprese salad is something I eagerly await from the beginning of every summer. It demands the freshest, most ripe tomatoes, so the reward doesn’t come until the end of the season, but it’s well worth the wait. Insalata Caprese (salad in the style of Capri) is defined as a simple salad of fresh mozzarella, tomatoes, and basil, simply dressed with olive oil, salt, and pepper. I needed to make a batch of pesto with all my basil so I changed it up a bit with a pesto dressing. My pesto does not contain pine nuts, a traditional ingredient, because Ella is “sick of them” (that means she’s allergic to tree nuts). I happen to love pine nuts and, if you’d like to add 1/4 cup of them to your pesto, I encourage you to do so. 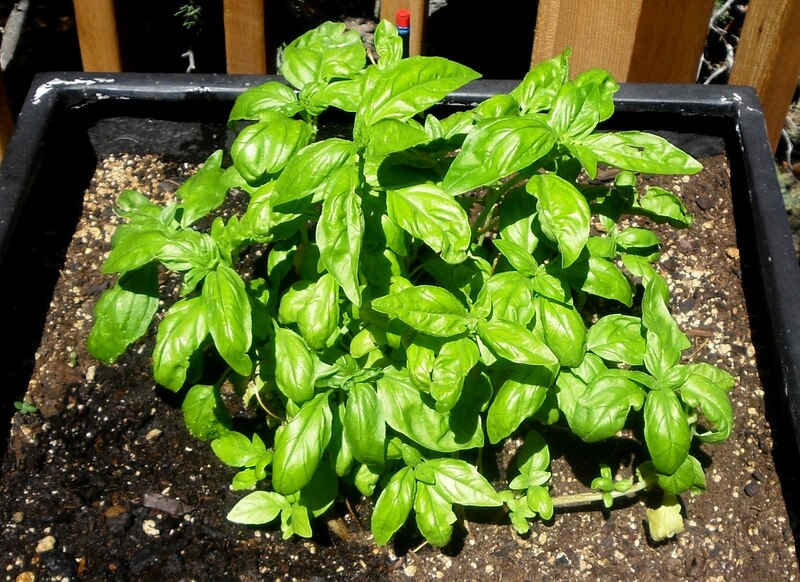 Place basil leaves, garlic, lemon juice and olive oil in the bowl of a food processor and process until the mixture is smooth. Add salt & pepper (start with a pinch of each and taste, remember the cheese is going to add saltiness as well). 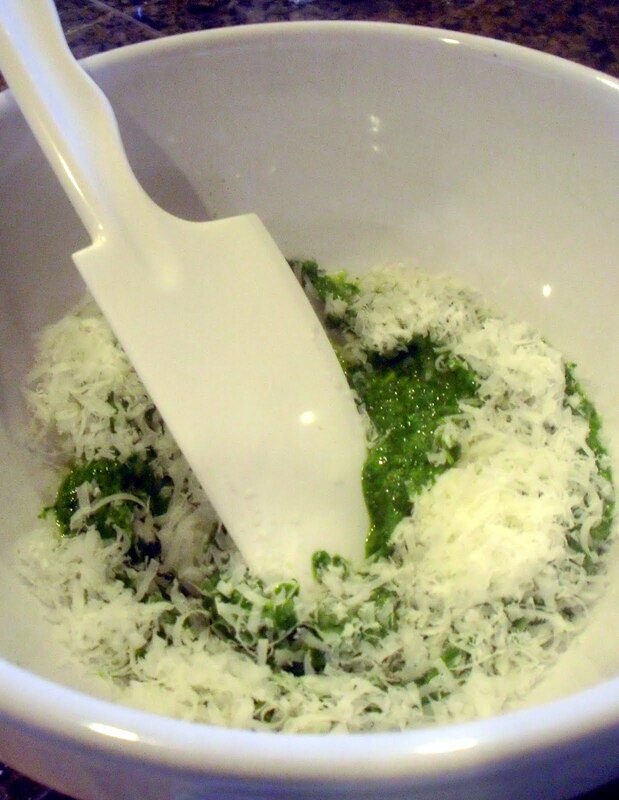 Transfer to a medium-size bowl and stir in the grated cheese. Taste it, it should taste strong and fabulous. If it needs salt or pepper, add it now. 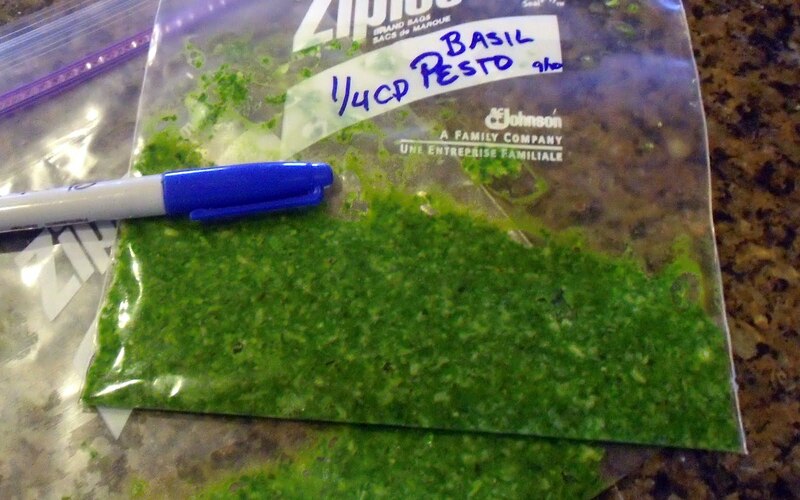 Reserve 2 TB of the pesto to make the dressing and freeze the rest. Some say the cheese doesn’t freeze well but I’ve had no problems with it, so, add it or leave it out, your choice. Use it to season soups, seafood, chicken and, of course, pasta. It will add a little blast of summer to your fall and winter comfort foods. 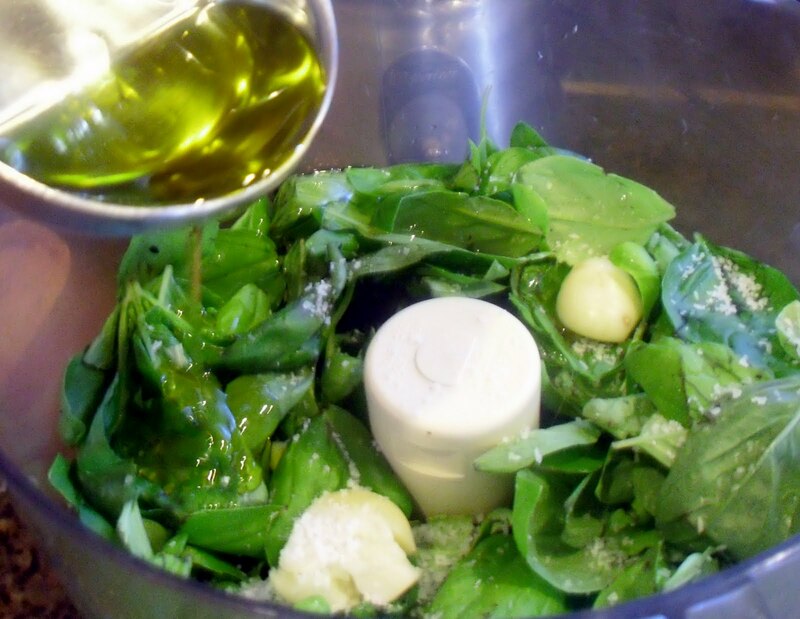 I, very simply, place 2 TB pesto in a mixing bowl, add the juice of one lemon and @ 1/2 cup olive oil and whisk, vigorously, until blended and thickened. Add salt and freshly ground pepper to taste and it should be ready to dress the tomatoes and mozzarella. 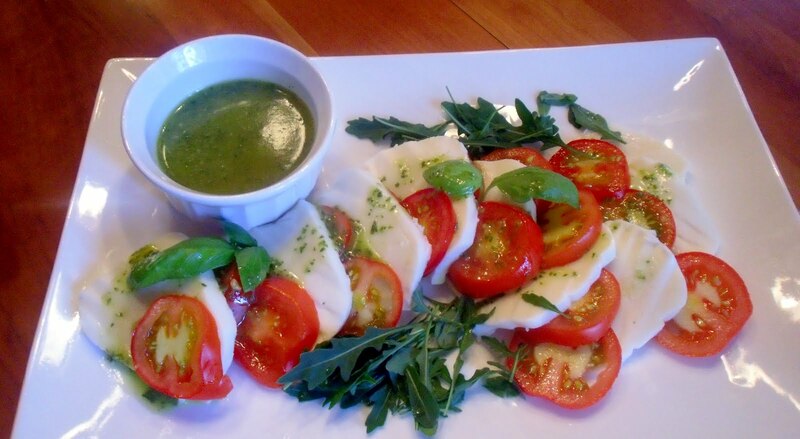 To assemble the salad, arrange slices of fresh mozzarella with sliced tomatoes on a platter. If you don’t have homegrown tomatoes, try to find them at a local farmers market because they really are the star of the show. 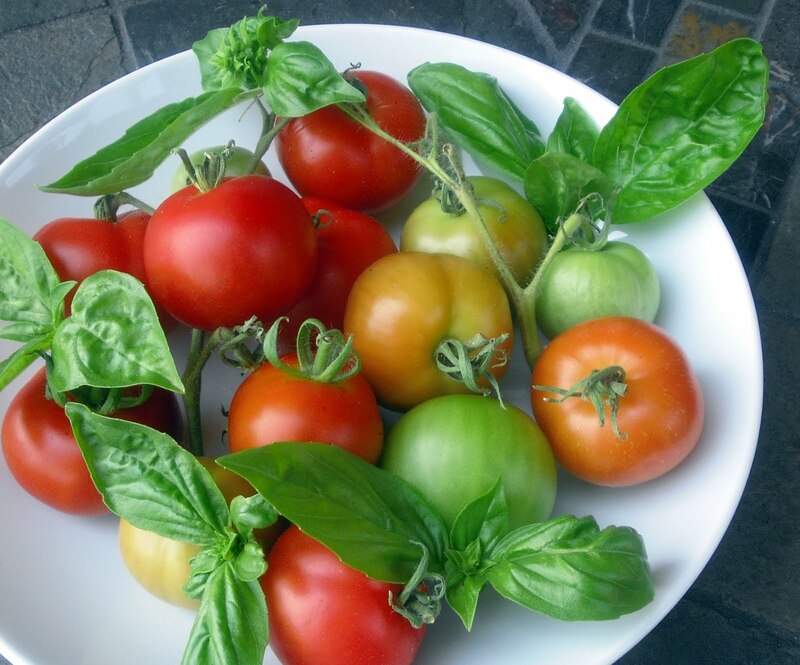 I love to use heirloom tomatoes of all different colors – gorgeous! Garnish with fresh basil (I also used some fresh arugula and it was lovely, but not absolutely necessary) and drizzle a bit of dressing over the top. Serve with remaining dressing alongside so everyone can add it to their liking. Fire up your grill before the weather turns and serve this lovely salad with steaks, chicken, or fish. We grilled some shrimp that had been marinated in lemon juice and a touch of pesto and it was a wonderful meal!